Whether Paul Manafort (whose very existence in the Trump campaign he chaired for five months the White House is now basically denying) has anything to say about that will depend on the nature of any plea bargains he made with federal prosecutors. 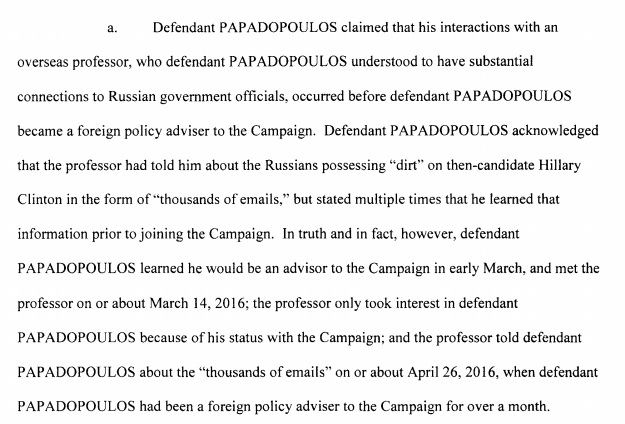 But the other indictment unsealed today, for Trump's "foreign policy advisor" George Papadopoulos, is pretty straightforward on the subject of the mutual courtship between the Trump campaign and the Putin regime. Papadopoulos, who coordinated with an unnamed "supervisor" in the Trump campaign, has already pleaded guilty. There is a technical sense in which Trump's tweet is accurate, however. "Collusion" is not really the correct legal term for what Trump and his associates are suspected of. The appropriate term for a plan to violate the laws of the United States, or give aid and comfort to its enemies, is "conspiracy." A president who cannot admit that an attack on American democracy has taken place is a president who is refusing to defend American democracy against the next one. Reality doesn't change just because a frustrated president shouts something on Twitter. It's bad if it's even possible for an admitted criminal to "flip" on the President of the United States.